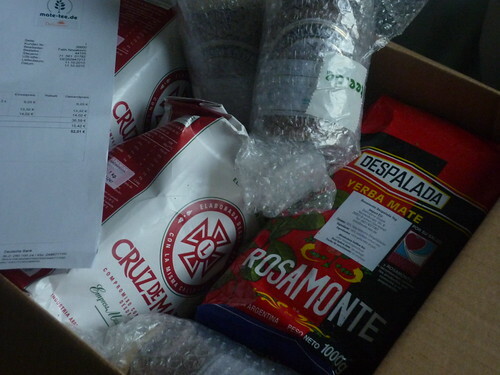 A box of goodies was waiting for me when I got back from work this afternoon: Cruz de Malta, Rosamonte mate…. and Salamandra Dulce de Leche.. I ended up buying from mate-tee.de, it just took a few days, and the price all included was somewhere around 1o-12 dollars a kg. Which is a lot more reasonable than going on buying the world’s most expensive yerba. Now off to dance, and when the little guy wakes me up at 5 AM, there is freshly brewed mate comforting his father. And dulce de leeeeeche.